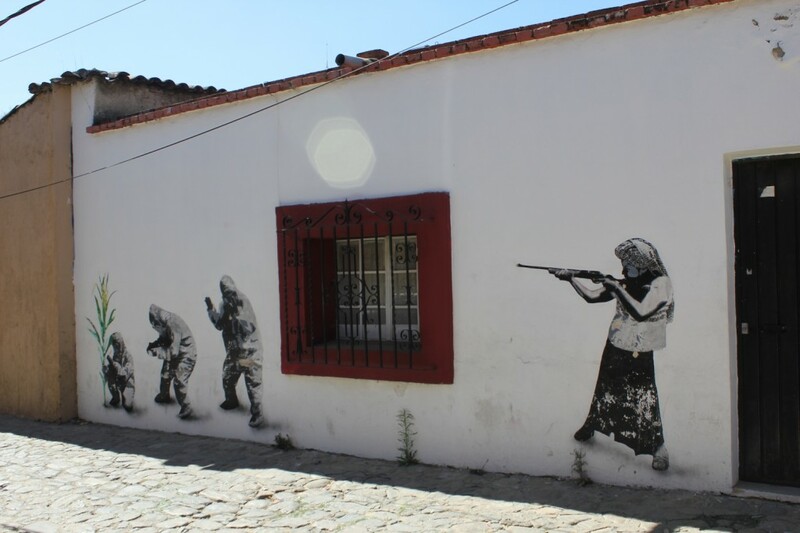 Home » Posts Tagged "grafiti"
From our very first day walking around we noticed there was something distinctly rebellious and innovative in the political culture in the state and city of Oaxaca. There seemed to be an energy present – in the air… on the political posters and painted on the walls… Also, since quashing the rebellion in 2007, which Kelly wrote a bit about in the previous post, the Mexican state has a constant and menacing military police presence patrolling the city, its officers always in black uniform and bullet-proof jackets and sometimes also in black ski masks, circulating through the city streets in pick-up trucks with mounted machine-guns. The city is home to a diverse plurality of experiments in living, organizing and creating that have been going on for at least for the last decade. 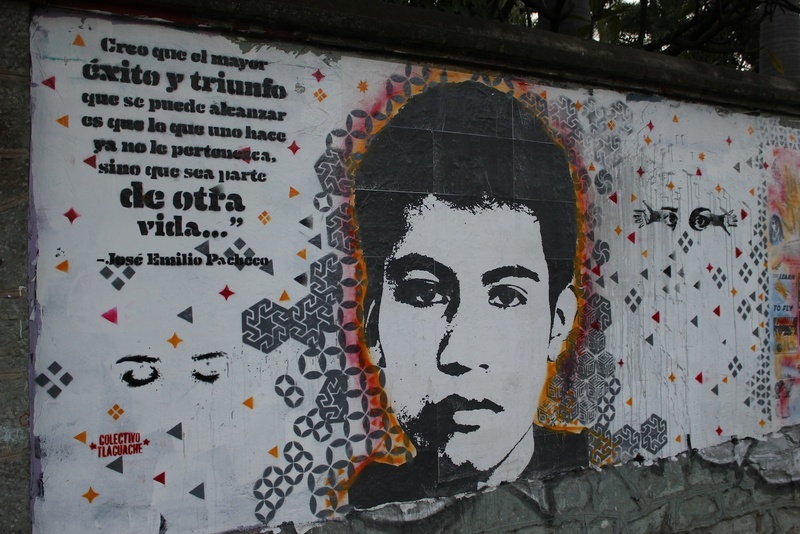 Indigenous identity, forms of organizing, learning and relating to each other and nature are important in these Oaxacan experiments in living and resisting. Indigenous ways of knowing and key concepts and practices such as ‘comunalidad’ and ‘interculturalidad’ (which we write about elsewhere) have become important in this changing political culture, slowly finding their way into schools and universities across the region, pushed for by indigenous activists and intellectuals. 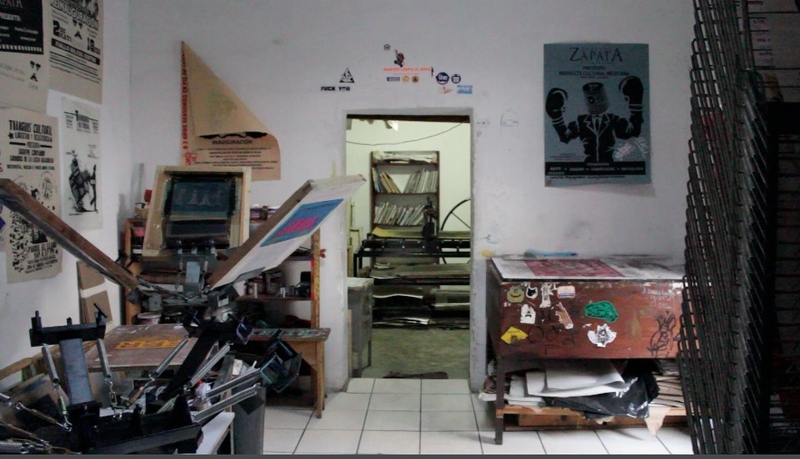 During our time in Oaxaca we encountered different kinds of social, political, artistic and ecological experimentations taking place across the city. We were very lucky to spend time with one experiment that is equally social, ecological, artistic and political in its creative and critical ways of being. This ‘experiment’ is the Universidad de la Tierra, or Unitierra as it is more commonly called. Unitierra has been, since its beginning in the 1990s, an important hub in this fermentation of new forms of living in and around the city. We will be posting about our various experiences, encounters and learning(s) as related to Unitierra. 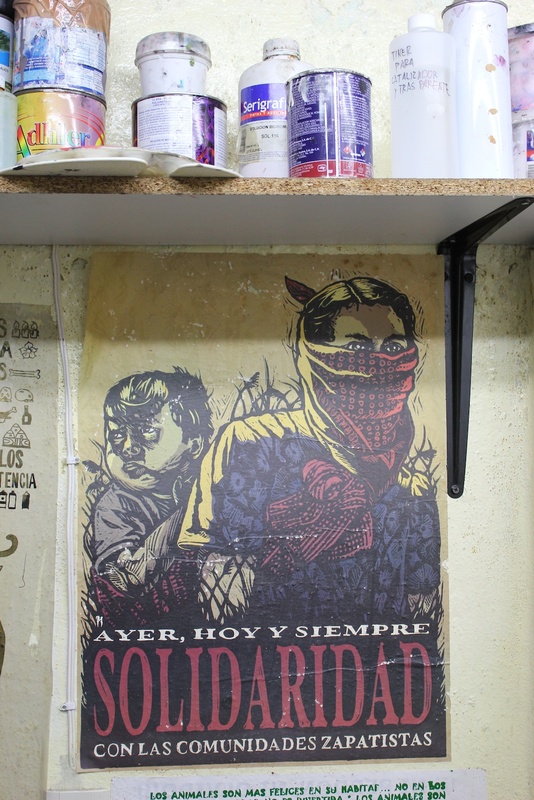 What I wanted to describe here is the most expressive sense we had of this culture of rebellion, both here in Oaxaca as well as in Chiapas where we also spent some time. 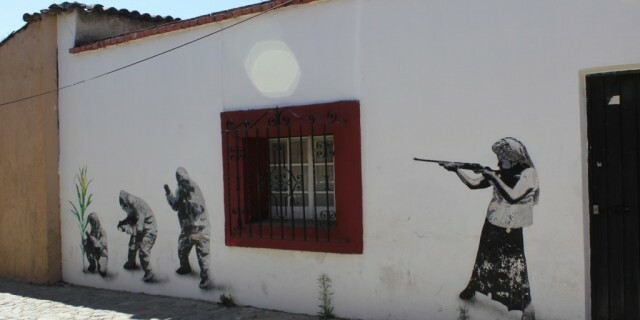 The walls of Oaxaca are covered in murals, graffiti, stencil and political posters. The city is also home to a number of artists’ collectives and creative spaces that produce this rich collection of images. Kelly and I both felt how these images speak about present concerns, key ideas and hopes of this surrounding political environment: the corporate take-over of land and resources and the imposition of genetically modified corn; continuing state oppression and abuse of people’s rights; indigeneity; communities attempting to live differently in balance with each other and with nature. Early one morning we walked around the downtown area and found what became our favorite stenciled piece painted on the wall in a small street, next to a collective art space, a few minutes from the bus station. 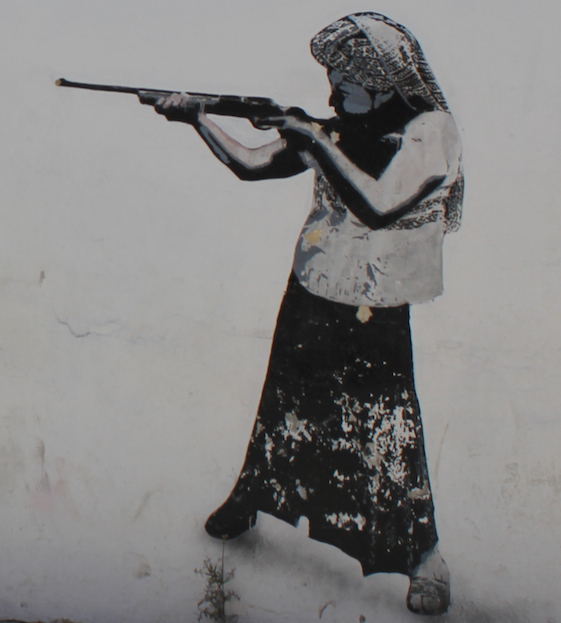 The simple but elegant image shows a woman pointing a shotgun at a group of figures dressed in radiation or contamination suits who appear to be either planting a new species or stealing her planted corn. The woman is wearing a local indigenous headscarf and shirt whilst the other figures represent external ‘alien’ forces allied to corporations who are pressuring the state and local farmers to adopt genetically modified corn (see a separate post on this). 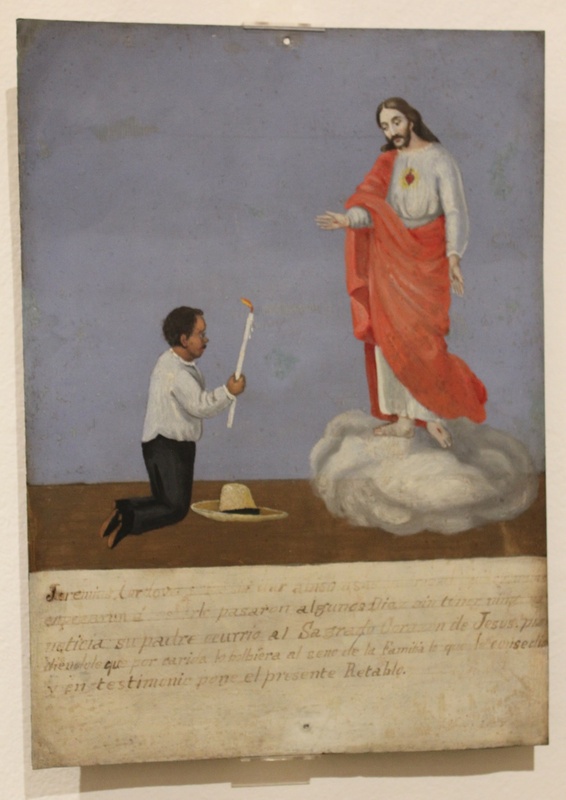 This work (the first image at the top of the page) though simple in appearance shows an important topic touching on many campesino (peasant) and indigenous communities across the country and provides an imagery of resistance that inverts the normal power relations. 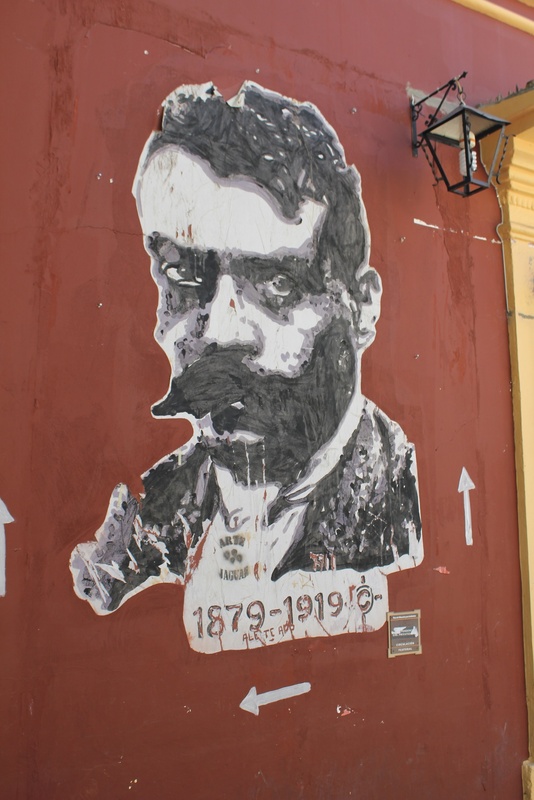 This art of political murals stretches back almost one hundred years in Mexico. Dating from the period after the Mexican revolution of 1910, which overthrew the dictatorship of Porfirio Diaz and was started and propelled by peasants, indigenous and generally people displaced the land. Mexican anthropologist Guillermo Bonfil Batalla, who coined the term Mexico profundo to refer to the Meso-American culture that continues to deeply influence Mexican national culture, has been a hugely influential figure around debates concerning the past and recent conditions of the country’s indigenous populations. The notion of Mexico profundo (or ‘deep’ Mexico) is in sharp contrast to the distinction Batalla makes with the ‘imaginary’ Mexico, or the Mexico that has tried to imagine its way into a domineering existence and has largely failed because of the continuing strength of the millions of people who comprise deep (profundo) Mexico. Hundreds of square metres of murals adorn every type of public building in many cities of the republic. Murals are in seats of government and public offices, in markets and hospitals, in schools and libraries, in factories and workplaces. In these murals, the image of the Indian is practically indispensable. Rarely is there missing some allegory about the precolonial world that frequently lays the foundation for or presides over the scenes of the world today or tomorrow. the bucolic life of the campesino, popular handicrafts and folklore. In music, dance, literature, and the plastic arts, the theme of the Indian provided the basic elements for shaping a vast nationalistic current under government patronage. 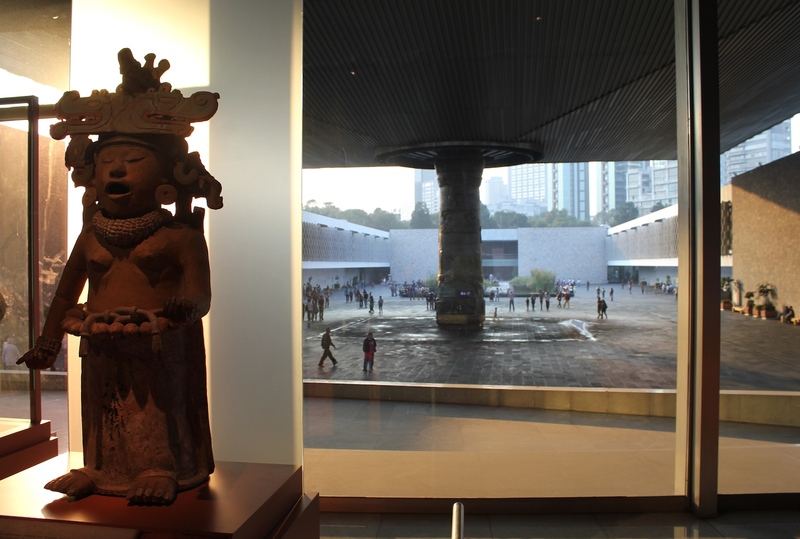 For Batalla museums also played a key role in this process of ‘exalting the Indian roots of Mexico’ something clearly seen in one of the Mexico City’s most famous attraction, the Museo Nacional de Antropologia (National Museum of Anthropology) in Chapultpec Park, a wealthier part of the city. We spent many hours in the museum but managed to see only a small fraction of it, exhausted by the overwhelming number, diversity and amazing quality of the objects displayed. The Indian presence as depicted in murals, museums, sculptures, and archaeological sites, all open to the public, is treated essentially as a dead world. It is a unique world, extraordinary in many of its achievements, but still a dead world. Official discourse, translated in the language of the plastic arts or of museography, exalts that dead world as the seed of origin that gave rise to today’s Mexico. It is the glorious past of which we should feel proud, which assures us of a lofty historical destiny as a nation, even though the logic of that assertion is not entirely clear. The living Indian and all that is Indian are relegated to the second floor, when they are not ignored or denied. As in the National Museum of Anthropology, the contemporary Indian occupies a segregated space, disconnected from the glorious past as well as from the present, which does not belong to him: an expendable space. Through an adroit ideological alchemy, that past became our past, a simple reference to what existed as a kind of premonition of what Mexico is today and will be in the future. It has no real connection with our contemporary reality and our collective future. The art objects and visual expressions we have seen in Mexico from the inexhaustible museum of anthropology, the temples, the work of twentieth century artists like Kahlo, Riveiro and Siqueiros, the murals and street art in Oaxaca and Chiapas, have made me reflect more on these connections between art, politics and the construction of identity. Our brief but deep immersion into the art of the Northwest Coast of Canada taught us much about the languages and grammar speaking through these forms, the deep relationship to place, stories carved into living beings sacred to these communities and the importance in their role to preserve cultural practices and identities (see posts on Freda Diesing School). 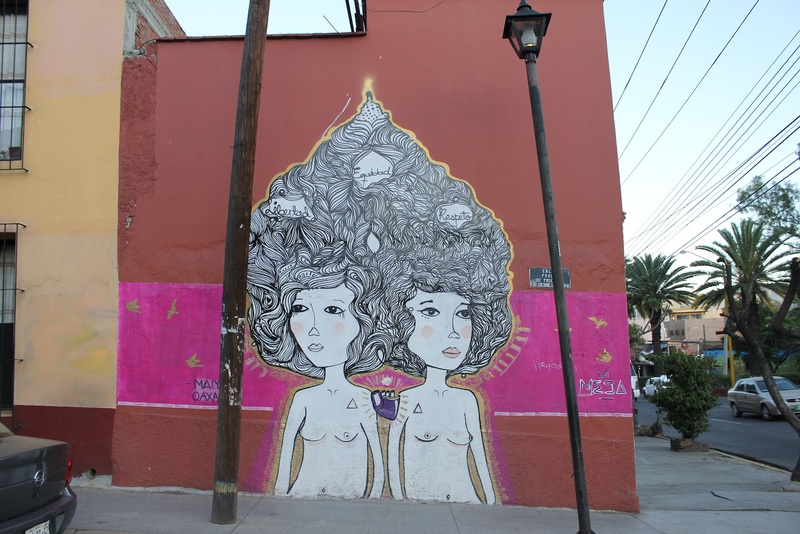 How did this experience of art here in Mexico relate to that in Canada? What is the place that this art emerges from, what language and forms and stories does it draw from? How does it preserve cultural practices and imagine new futures and identities? Kahlo, Riveira, Siqueiros and many other artists of this generation were involved in a broader post-Mexican revolution period of crafting a new national identity, as Batalla explained. 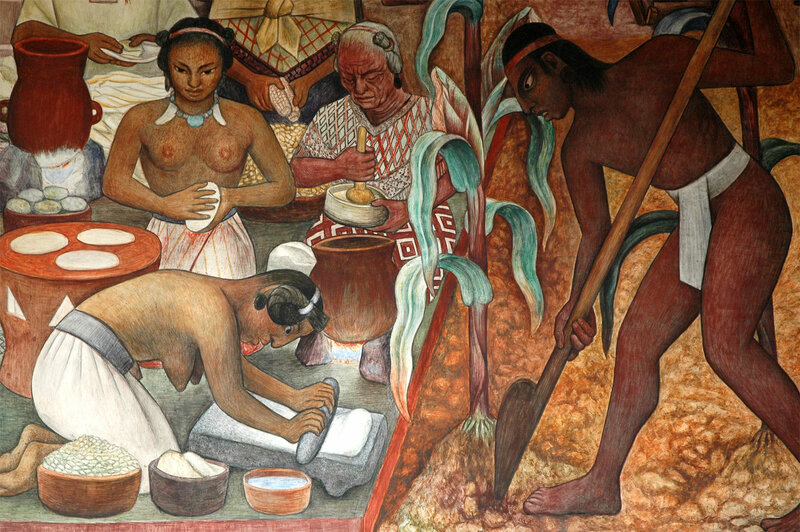 As artists they were creating a new imaginary for the country by drawing on various local and avant-garde pictorial traditions, such as votiv paintings and surrealism in the case of Kahlo or mural painting and social realism for Riveira. 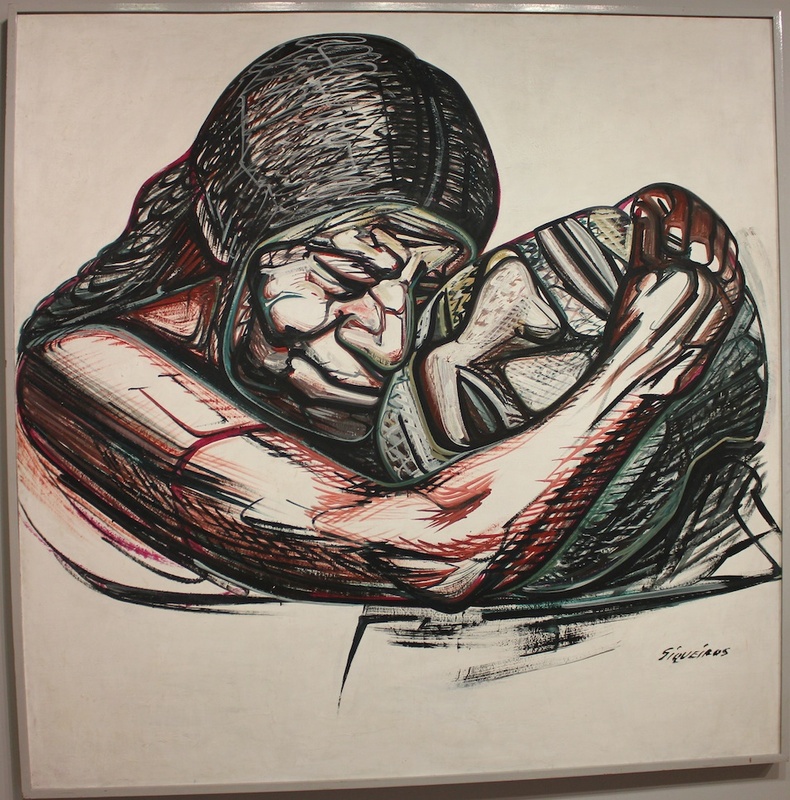 These were artists who were also deeply engaged in the broader political and ideological struggles of their day, both Kahlo and Riveira as well as concerned with questions of national identity were also committed communists. 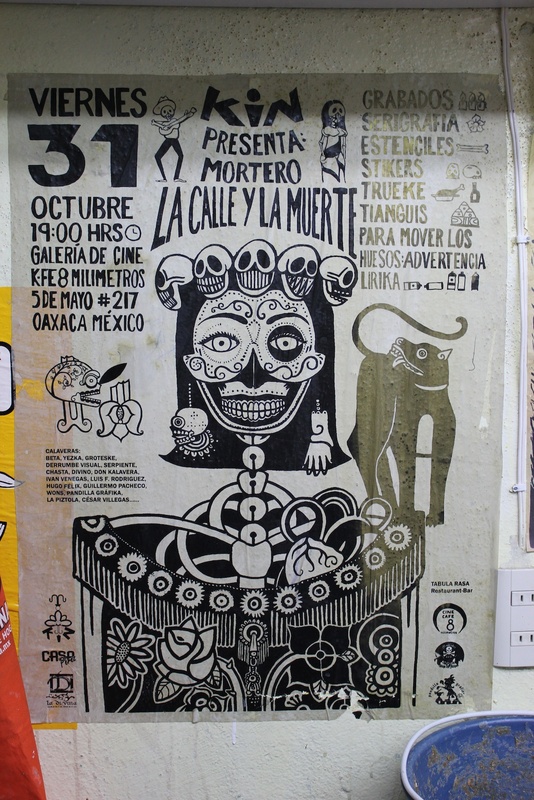 These artists used their creativity and imagination to visually represent the marginalized, exploited and oppressed, as well as to promote anti-capitalist counter culture in Oaxaca. 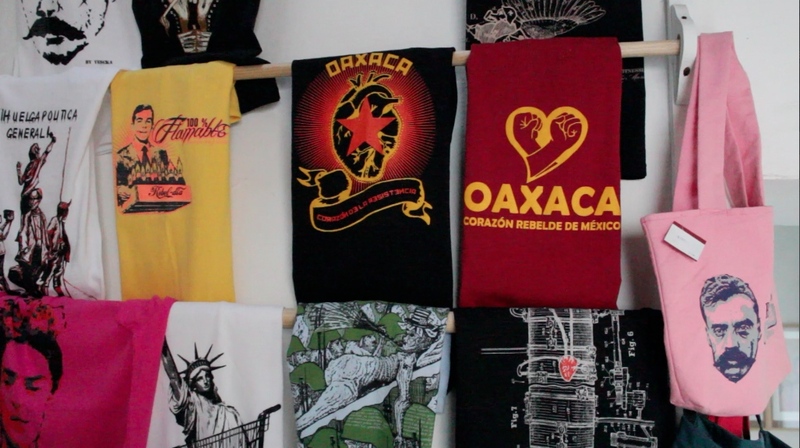 The movement showed its capacity not only to organize political acts, but to create artistic and culture events to recover a history of Oaxaca unmediated by the sheen of tourism. 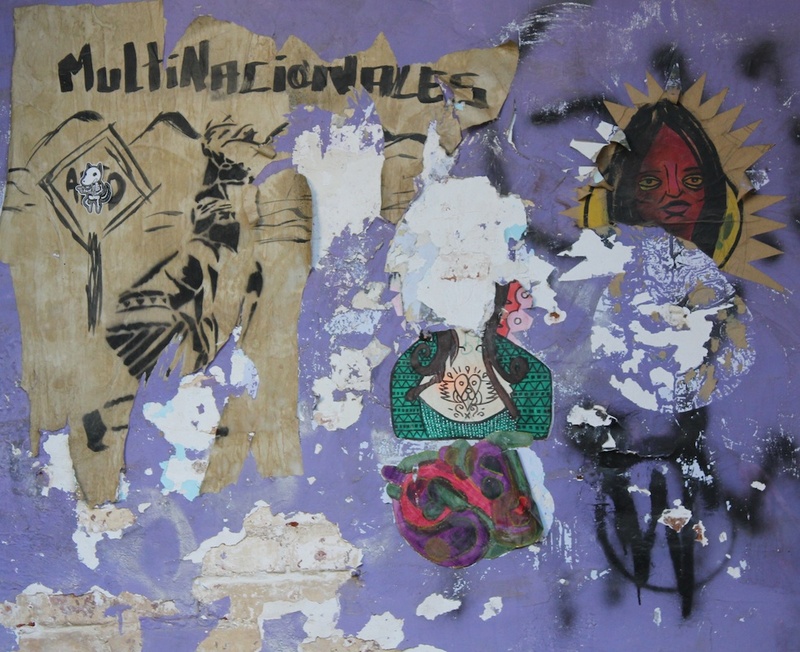 The walls of the street and the artists’ collectives then provided other images and imaginaries. In some of this art the Indian which in Batalla’s argument had only served to represent a fossil of past glory and as such an innocuous ingredient contributing to national identity surfaces as a living subject, as someone talking back or resisting the current situation. Such is strength of resistance in the indigenous woman from Mexico profundo pointing a gun at the genetically modified corn pushers furthering their imposition of an alien cosomivision. These street artists then exemplified something we came to learn more deeply during our time in Oaxaca, the importance of autonomy in the face of various state or corporate institutions that we have grown dependent and as such subservient to regarding our education, health, food, communication and even sanitation (more on this soon). 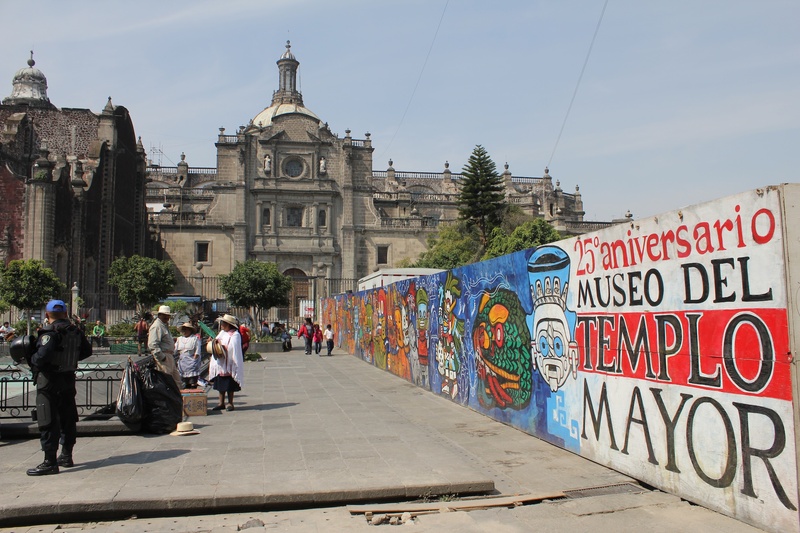 In their case the walls of the city were a means of taking back the spaces for communication and visual expression.